Bhubaneswar: Prime Minister Narendra Modi will visit Sambalpur and Bhubaneswar on April 16. The saffron party has fielded Aparajita Mohanty and Nitesh Gangdeb from Bhubaneswar and Sambalpur Lok Sabha parliamentary constituencies. 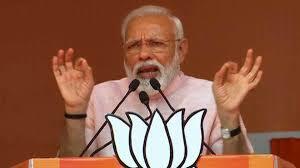 Meanwhile, the PM addressed election rallies in Sundargarh and Sonepur in western Odisha where voting for simultaneous assembly and Lok Sabha polls will take place in second phase on April 18. Party national president Amit Shah will also address a rally in Keonjhar district on Friday. Anant Naik is the saffron party candidate for the Keonjhar Lok Sabha segment. Earlier on April 9, Shah led a roadshow in Puri to bolster the prospects of his party in the Lok Sabha and State Assembly elections. Shah had also visited Odisha on April 7 and addressed two election meetings at Polosara in Ganjam district and another at Baragarh in the western part of the State and appealed to the voters to vote in favour of BJP and bring a double engine Government both at the Centre and State. Voting in Keonjhar Lok Sabha constituency and seven assembly segments falling under it is scheduled in the third phase on April 23.